We believe we have a lot to learn from women food producers about how to foster true resilience, how to live on a finite planet, how to consume less and share more, how to foster compassion and courage, and finally, how to wake up and engage with present daunting realities. 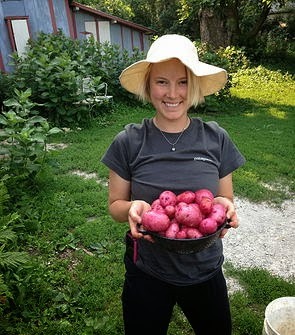 What do women farmers, sustainable food, the next generation and bikes have in common? A project called Shifting Gears. Led by Caitrin Hall and Lake Buckley, Shifting Gears is an inspiring feat that took the motivations of “Farmer Jane” – exploring and celebrating women’s contributions to sustainable agriculture - on the road. It bodes well for the next generation of women changemakers that these two twenty-somethings designed a project that would bring them closer to women in their fields while utilizing the most benign form of transportation, the bicycle. From New York to California, nearly 4,000 miles, Caitrin and Lake visited urban and rural women-led farming operations alike. Call it an extensive informational interview of sorts, they rode to achieve “layers of dialogue, the documentation of alternative food systems, the female perspective, and bicycle transportation as inter-related mechanisms for change towards a more just and compassionate food system.” I call it - pure inspiration. While the interrelationship between agriculture and bicycling may seem obscure, sustainable food advocates realize that the reduction of the externalities caused by the distribution of our food presents one of the biggest challenges in making our food system truly sustainable. Namely, that to achieve our desired carbon-neutral, environment-enhancing food system, we inherently need to tackle not only off-farm inputs and biodiversity, but also the mode in which we get food on peoples' tables. Despite this desire bicycles still play a minor role in farm delivery systems despite the creation of farms such as the women-led Ten Speed Greens in Florida. Caitrin and Lake didn't cover any such farms but they did successfully bring distribution into the project's dialogue by simply riding to each destination. Along their trip Lake and Caitrin got some serious road miles on their legs and their visits opened their eyes to the realities of farming as a woman in the U.S.; they discovered how women are successful and learned about the disparities that women still face; and ultimately, they found hope in meeting some of the members of the fastest growing demographic to own and operate farms in the U.S.
FJ: What did you learn about women farmers that surprised you most? Lake: The amount of discrimination out there surprised me. We knew about the lawsuits [against the USDA] and that discrimination was present, but we hadn’t experienced the telling first hand. That was really eye-opening. Caitrin: For example, one farmer in Fairfield Idaho can’t get her compost delivered to her farm unless it’s ordered on behalf of her husband. They refused delivery to a woman. And since she doesn’t have a confrontational personality, she continues calling in the orders on behalf of her husband even though she’s the farmer and her husband is not. Also, when we were in Iowa we learned about the challenges of women who have inherited land but have never been asked what they want to do on the land. Generally speaking what they want is in opposition to what the extended family wants. Women tend to want food, family and conservation land which goes against more conservative family’s farming ideals. There have been circumstances when extended family will sue or put a restraining order on the woman to take control of the land. 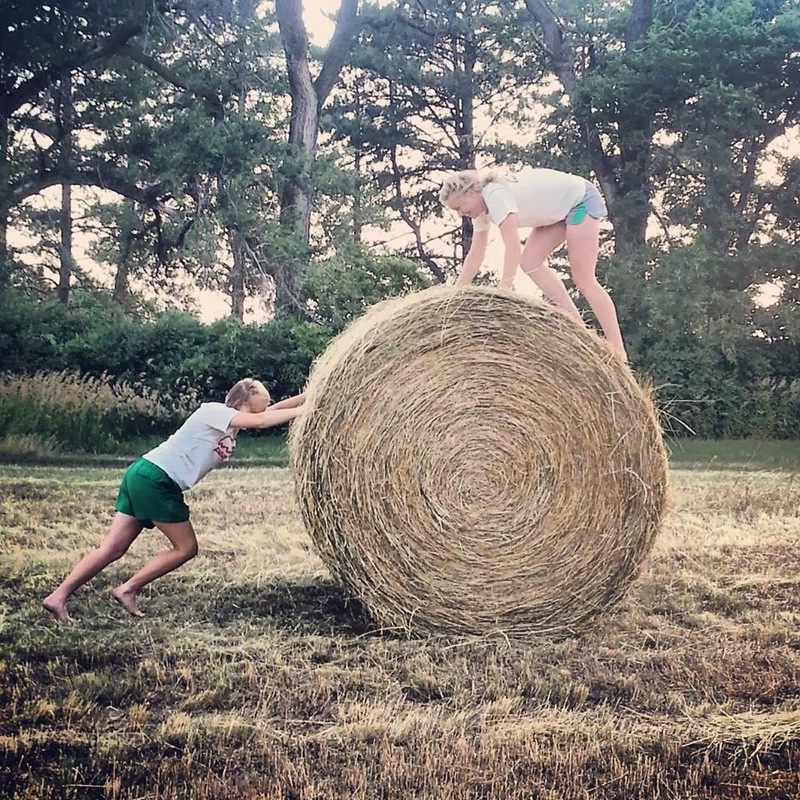 We found that in Iowa there is a super rigid cultural definition of what it means to farm there. Women don’t have a place in farming even if they own it! FJ: What were some of the most memorable farms stops? Lake: Denise [O’Brien] of Rolling Acres Farm in Iowa was one of them. It was amazing to learn about the formation and activities of the Women Food and Agriculture Network (WFAN). I loved listening to her speak and was blown away by her ability to empower women and to farm holistically while being completely surrounded by a male-dominated farming culture concerned primarily with the bottom line. When we were biking to her farm, we saw it from afar as an oasis. It was the first time we had seen trees and butterflies since entering Iowa. Everything else was fence row to fence row corn. Caitrin: She’s pretty much taking care of the biodiversity of the state! Lake: Beth Rasgorshek who runs Canyon Bounty Farm and Janie Burns of Meadow Lark Farm were inspiring too in that they are working together to rebuild local grain infrastructure in addition to managing their own farms. Janie and Lake buck hay in Idaho. They learned that research isn't meeting smaller-scale grower's needs when Beth realized that she couldn’t get enough nitrogen in her soil. When she reached out to land grant universities to see if they were researching heirloom wheat varietals, they wouldn’t take her seriously because her operation is so small. The research that is being carried out in our land grants tends to focus on conventional seed for industrial farms making the seed and research generated unserviceable for a farmer like Beth as conventional wheat-berry protein levels are dependent on excessive nitrogen inputs. So, on top of running a farm, Beth is doing the market and varietal grain research and breeding herself to further understand how cross breeding will impact protein levels and flavor. In addition, she's partnered up with Janie to try to figure out if it’s viable to build a local mill. At every step of the food chain there’s a link missing, so they’re farming and trying to piece the fabric back together. 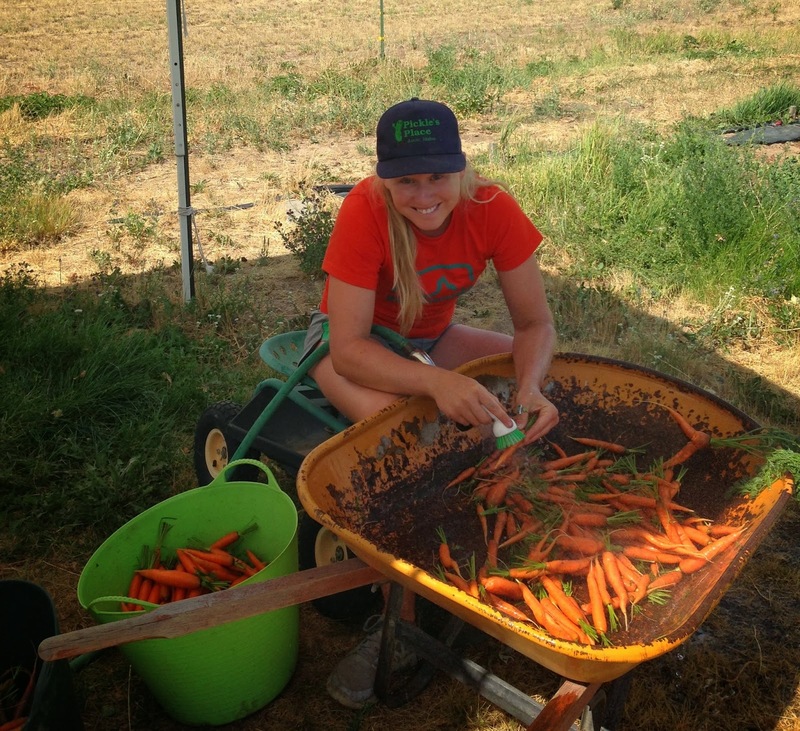 Caitrin: Maisie Ganz of the Soil Sisters in Nevada City, CA was really memorable! She’s built sustainability into their ethos. Not just about the land and production but on an energetic level. I think we have an illness of overworking in our society. Farmers especially are overworked, and especially on diversified farms doing all that hard work. The workhorse, drive, drive, drive mentality is in place for farming as a career despite not making very much money. Meeting women who are dedicated to taking care of themselves as much as they take care of the land and their flowers was so refreshing. This is something that we need to keep in mind and an aspect of feminine wisdom what we need to hold and perpetuate. FJ: Were there any common needs between the women farmers you visited? Lake: We would often have the amazing opportunity of having a potluck and all the women would talk about how they needed more get togethers. Isolation, or just being a farmer that works very hard in this unique lifestyle, makes it hard to have a social life and the social piece is so important. Other needs included needing a better economic model that makes farming a viable occupation, appropriate technologies for the small scale and outreach, and networks, like WFAN. Not to mention the personal sustainability piece – it’s hard to take care of yourself and the farm. FJ: How has this trek changed your view of farming as a woman? Lake: I have so much faith in women farmers. There’s an element of nurturing, holistic seeing and long-term vision that are crucial in the farming sphere and the women we met have that view. I have so much faith and hope that this demographic of farmers will continue to grow. There’s a certain way of doing things with feminine qualities that have so much potential for real progress. Caitrin: I just have a huge respect for women farmers. It’s incredibly hard work, an incredibly hard market and culture to participate in yet they perservere while nourishing themselves. They are generally making the world a better place. They are enlivening the world and making it better. Details of the women farmers that Caitrin and Lake’s visited and their road adventure can be checked out on their website at http://www.shifting--gears.com.